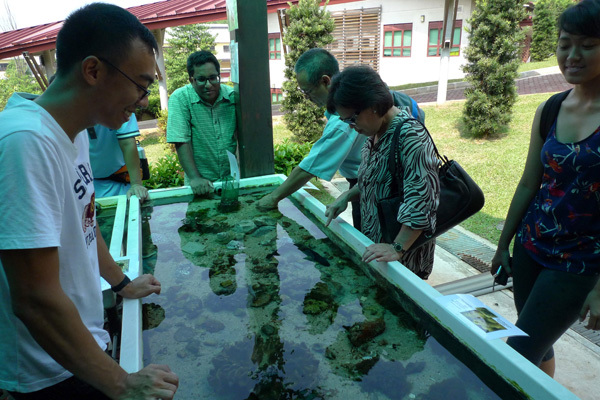 The Tropical Marine Science Institute, TMSI in short, is an institution formed with the National University of Singapore (NUS). The institution aims to play a strong role in promoting integrated marine science, in research and development, as well as to establish itself as a regional and international education and training centre through active collaboration with academic, government and industrial sectors. Major research areas in TMSI are Marine Environmental Management; Underwater Remote Sensing and Oceanography. There are two TMSI research facilities - one located on the main campus of NUS at Kent Ridge while second is located off mainland Singapore at St. John's Island (SJI). The institution also has research vessel, Galaxea, allowing researchers to conduct experiment in Singapore waters. I may not be familiar with TMSI's research facilities at Kent Ridge but I have been to their research facilities at St. John's Island on quite a number of occasions. I am not a marine scientist nor am I working in the research facility. 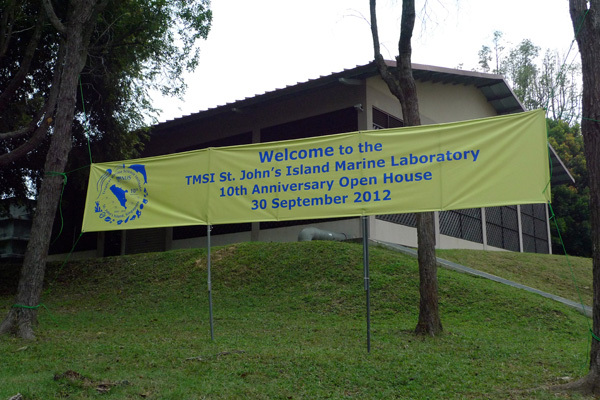 The TMSI facility at SJI was officially opened on 3 October 2002, focusing on marine science research. It is Singapore's only marine research facility and also around the region. The small looking facility is rather well equipped to many people's surprise. The two main research blocks housing well-equipped laboratories to support a diverse range of marine biology and aquaculture research. The two main research blocks. A main administrative building housing meeting rooms, a small library, a seminar room, offices for senior scientist and a general office. Next to the admin block is a dormitory block for researchers to sleep on the island when conducting experiments overnight. It has a laundry room and air-conditioned bedrooms, accommodating up to 20 people. There are no food stalls on the island but the facility has a working kitchen equipped with induction stove, refrigerator and microwave oven to satisfy the rumbling stomaches of staffs. Located on an off shore island, the SJI research facility gets easy access to flow-though raw, unfiltered seawater with options for filtered seawater or recirculating filtration. There are two indoor aquaria with tank capacities up to 1000 litres within few walking steps from the research blocks and an outdoor area with large aquaculture tanks of capacity up to 5000 litres. Wet laboratories in the research blocks are also outfitted with seawater tables. Why am I sharing so much about the TMSI facility at St. John's Island? 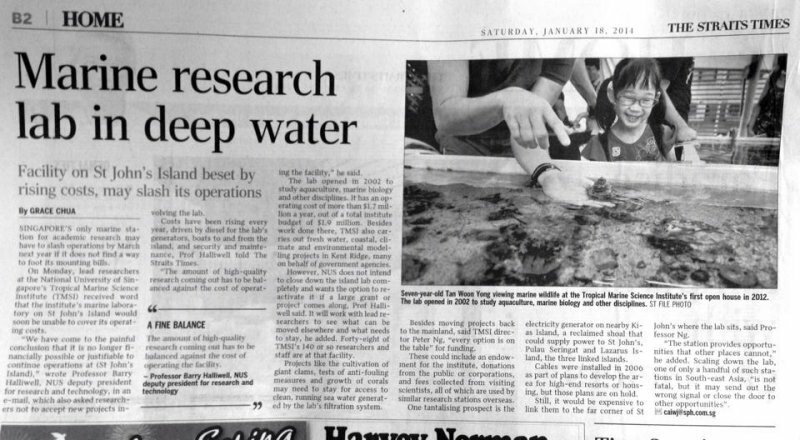 Just a few weeks ago (early Jan 2014), I was sad to hear that the marine research facility will soon be shut down due to high operating costs. If the lack of strong funding continues, operations at the facility will stop by 31 March 2015. If the closure really happens, what will the future be for marine research in Singapore and in the region without a proper working marine laboratory? How will if affect marine research projects even from the moment the news was announced? 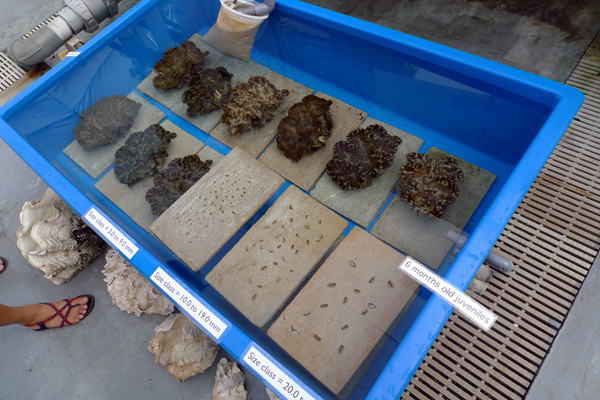 The SJI marine laboratory is important for some researches such as cultivation of giant clams, tests of anti-fouling measures and growth of corals that requires easy access to clean, running seawater from the facility's pump and filtration system. This easy access to seawater and close proximity to diverse marine habitats makes the marine lab at SJI so different and unique from its sister facility at Kent Ridge. Inspecting fouling organisms on a navigation buoy. As mentioned earlier, I am not a staff of this marine lab and neither am I a marine scientist. So how did I know about this amazing marine laboratory located on St. John's Island, an island where people in Singapore hardly step onto? My very first visit to this marine lab, and also to this island, began few years ago when I signed up as a volunteer for the Comprehensive Marine Biodiversity Survey (CMBS). They were conducting sorting sessions in one of the research labs and needed volunteers to help them sort out animals collected from mudflat surveys. I volunteered a whole week of my time helping them sort out marine animals. That was the time when I realised that some animals looked the same but different. From then on, I visited the SJI marine laboratory whenever my working schedule permits me to help in the sorting sessions, helped in their 10th anniversary open house and participated in a bryozoans and hydroids workshop. Marine lab 10th anniversary open house. Helping out at the touch pool during the open house. My hand was even featured in the newspaper report about the open house. However, seeing the same image of my hand on the report about the closure of the marine lab makes me even more sad about this announcement. My biggest involvement with the SJI marine lab would be the CMBS Southern Expedition in May 2013, based at a facility on St. John's Island behind the marine lab. 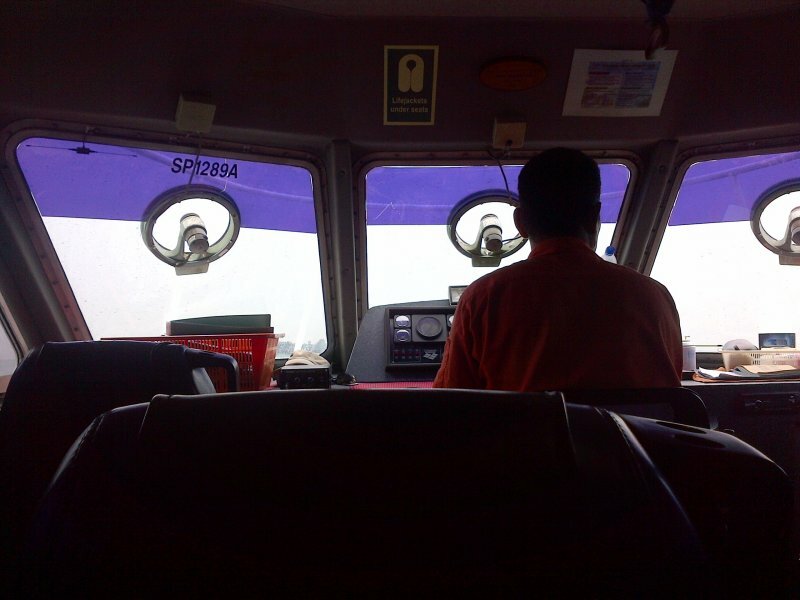 Daily scheduled ferry service to the island for the expedition. Happenings at during the expedition - tagging specimen containers with collection codes. 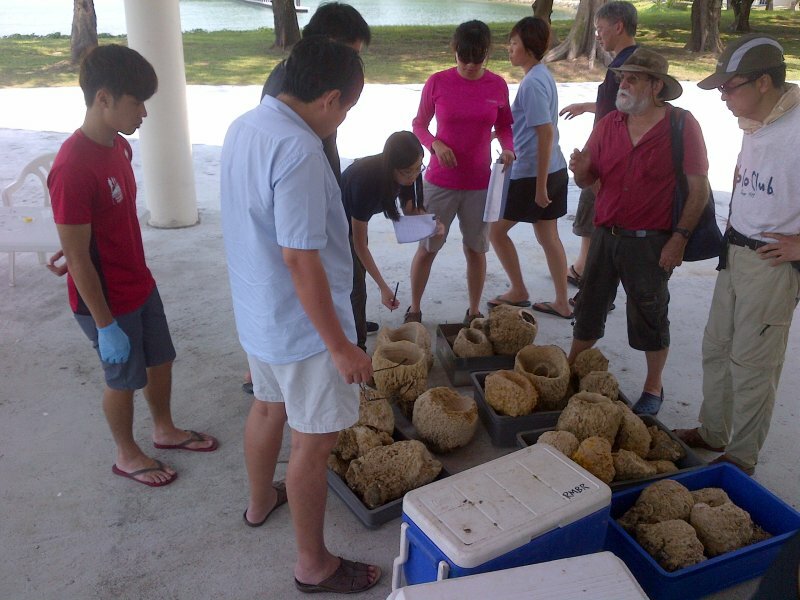 Reviewing the collection of sponges from dredging. With the news of the marine lab's closure, a few people that I know off have posted their thoughts in blog posts or on Facebook. Jocelyne Sze - Things from Tropical Marine Science Institue, St John's Island on Facebook. Through Jocelyne's Facebook post about her experience at SJI marine lab doing her A Levels H3 Science Research Project with TMSI-SJI, I learnt that the marine lab it not just a place for marine scientists or researchers. Curious about the new 'A' Level curriculum (2006 onwards) directed me to Ministry of Education's webpage about the 'A' Level. The H3 level subjects allows diverse learning opportunities for in-depth study in the form of advanced content, research paper or through university module. Students taking H3 subject must take the corresponding subject at H2 level. In the list of H3 subjects offered, one of the programme is the NUS-MOE Science Research, which I believe Jocelyne did. Here is a subject synoposes (PDF document) of the NUS-MOE Science Research. Molecular and Cell Biology, the Tropical Marine Science Institute, the Defence Science & Technology Agency, and the Singapore Botanic Gardens. This programme is accredited and examined by the National University of Singapore. Good ability 'A' Level students with great interest in marine biology or in research have an opportunity to take this H3 programme as part of their 'A' Level course, developing their capacity to learn independently, with some supervision, through experimentation and research. Prior to this new syllabus implemented in 2006, students are only offered 'S' papers to enrich their content knowledge of a subject higher than the subject content requirement offered at 'A' Level. 'S' paper classes are conducted within the school after curriculum time. With the change in the 'A' Level syllabus, students have a wider range of programme to choose from, including university modules. Other than partnering with Ministry of Education in creating a science research programme for 'A' Level students at H3 Level, TMSI-SJI has also conducted education and outreach programme to children and general public. This includes the open house where the research facility is opened to general public to visit and understand the working environment and ongoing projects at the facility. Other than the open house, the SJI marine lab has hosted visiting groups such as the group from Bukit Batok Community Centre and has conducted guided walks at St. John's Island for schools. Clearly, the value of TMSI's marine lab is more than just a research institution or a marine station in the region for marine scientist to conduct their research. The institute is just as valuable when it comes to education collaborations and public outreach programmes, as stated in their webpage. As part of TMSI's public education programme to create awareness in the marine sciences, the institute conducts organised short visits to our marine research facility at St. John's Island. The two hour programme will introduce visitors to marine science and research at TMSI, with two short talks on highlighting some of our research in the physical sciences and marine biology, and a mini-tour of our facility on St. John's Island. 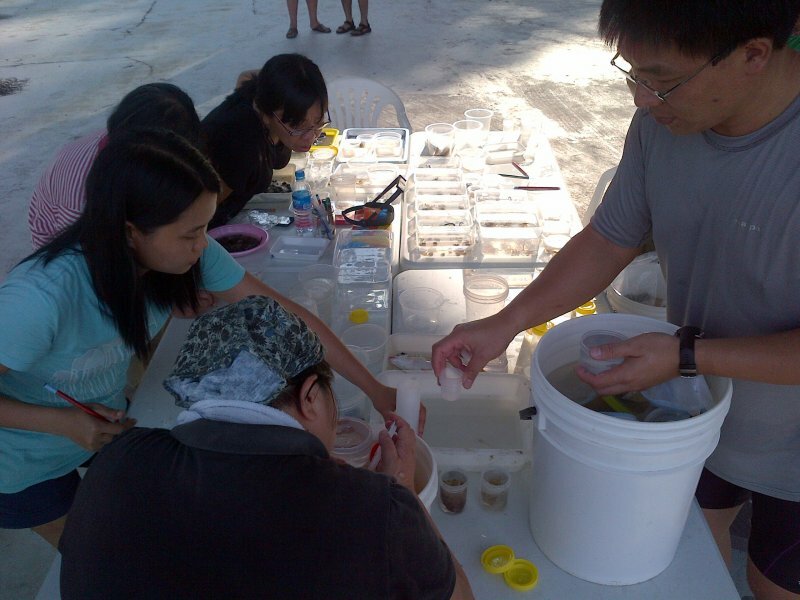 There have also been residential programmes and training workshops in marine science conducted at SJI marine lab, such as sea anemones, bryozoans and hydroids, bivalves and many more. 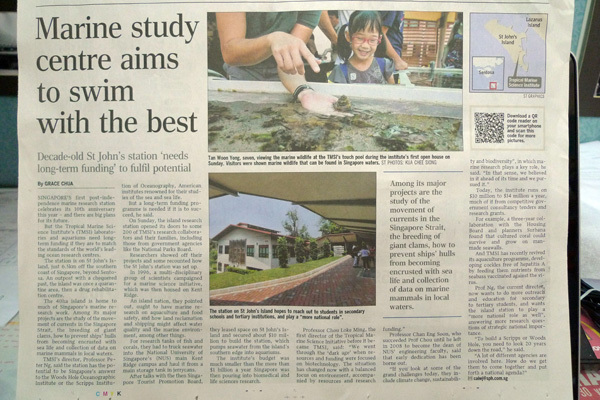 Perhaps the SJI marine laboratory outreach programme can be further enhanced and become a learning centre about marine environment and education, similar to what Field Studies Council does? I think there are endless possibilities in the potentials of such a wonderful marine station in Singapore. It is really saddening and heartbreaking to learn of the closure of such a great marine station due to high operating cost and lack of funding. Let's hope that things will turn for the better.